How carbon steels compare to other types? According to the American Iron & Steel Institute (AISI), Steel can be categorized into four basic groups based on the chemical compositions: Carbon Steel, Alloy Steel, Stainless Steel, Tool Steel. Carbon steel has become a popular material for use in the manufacturing industry. As the name suggests, it consists of steel along with a carbon alloy for enhanced properties. Carbon Steel can be segregated into three main categories: Low carbon steel (sometimes known as mild steel); Medium carbon steel; and High carbon steel. Low Carbon Steel (Mild Steel): Typically contain 0.04% to 0.30% carbon content. This is one of the largest groups of Carbon Steel. It covers a great diversity of shapes; from Flat Sheet to Structural Beam. Depending on the desired properties needed, other elements are added or increased. For example: Drawing Quality (DQ) – The carbon level is kept low and Aluminum is added, and for Structural Steel the carbon level is higher and the manganese content is increased. Medium Carbon Steel: Typically has a carbon range of 0.31% to 0.60%, and a manganese content ranging from .060% to 1.65%. This product is stronger than low carbon steel, and it is more difficult to form, weld and cut. Medium carbon steels are quite often hardened and tempered using heat treatment. High Carbon Steel: Commonly known as “carbon tool steel” it typically has a carbon range between 0.61% and 1.50%. High carbon steel is very difficult to cut, bend and weld. Once heat treated it becomes extremely hard and brittle. Technically, every steel is an alloy, but not all of them have the “alloy steel” designation. To be called alloy steel, other elements must be intentionally added to the iron and carbon composition. A small percentage of alloying elements — typically, no more than 5% — is added to the mix, and these metals can improve corrosion resistance, machinability, and many other properties. Tool steel refers to a variety of carbon and alloy steels that are particularly well-suited to be made into tools. Their suitability comes from their distinctive hardness, resistance to abrasion and deformation and their ability to hold a cutting edge at elevated temperatures. As a result tool steels are suited for their use in the shaping of other materials. This is an amazing post on carbon steels. 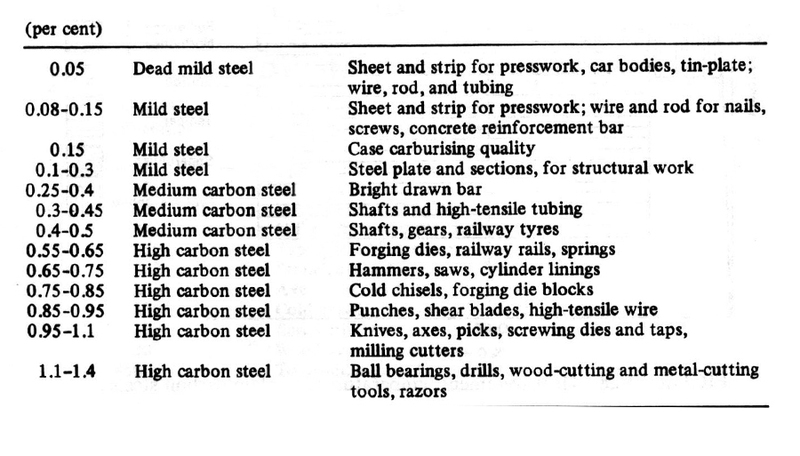 Very easily explained difference of carbon steel and its other types. I agree that, it consists of steel along with a carbon alloy for enhanced properties. Thanks for sharing. !